This is the line of crash from the lake shore to the resting place in someones from garden. 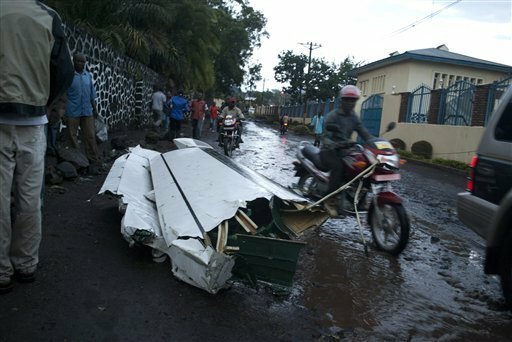 This Monday a CAA Fokker 50 airliner crashed in bad weather into a residential area of Goma. Rain and hail were reported at the time of the approach to land. The aircraft hit an antenna at the UN compound right on the lake shore. Part of the wing fell in a street a second later and the plane came to rest after hitting the roof of a house and a few stone walls. Seven people were killed, including the crew, but three survived and it was truly amazing that no one on the ground was killed. My sister, LuAnne Cadd, flew over a few days later with Lary Strietzel, one of our MAF pilots, and took some pictures. This shows some of the damage as the plane came to rest. Amazing that nobody was killed on the ground. I was shocked to hear the news but not surprised. This happens with frightening regularity. While looking for a picture to put on here I ran across another story I wrote last year but never put on the blog. I will put it below just to give you a feel for flying in Congo. A bit of the wing in the street after hitting an antenna. A very low approach. 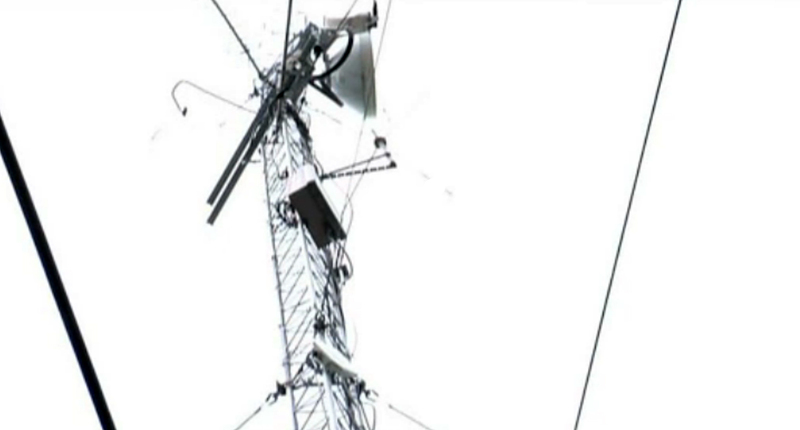 First strike was the antenna at the UN compound on the Lake Kivu shoreline. I was in Bukavu on Monday to pick up pax for Bunia and there was murmuring all around from the workers. It seemed that one of the local Antonov 28’s was 3 hours overdue and faces were drawn and sober. They told me that they had warned the pilot that the weather at his destination was not good but he had gone anyway. It was sunny in Bukavu and it is common for pilots in this type of situation to go ahead and take a look, planning to turn around if weather becomes a problem en route. Being a bit late is nothing unusual, still it was disconcerting to think about. Two days later I was back to take a load of hospital supplies to the Kipaka Grace Hospital and all seemed well. As I was paying the landing fees and taxes a man rushed in and was speaking French rapidly. The man at the table started yelling and stood up shaking his hands in the air. It was not happiness or grief, and I couldn’t put an emotion to it. Just noisy! Everyone was talking and finally one of the men turned to me and said, “It is the plane from Monday. It has crashed in the forest and all is lost!” Then he said, “one was refurbished”. I don’t know if that meant one was alive or one had just received treatment, but it was a strange way to put it. It is always sobering for a pilot to hear of such things and know that there are some very tricky situations out there and not everyone walks away. It is a wakeup call to keep to your safety standards and do the work it takes to avoid accidents. And it is work in this environment. I am always surprised at the number of derelict aircraft on any given runway in Congo. It was said in a recent National Geographic documentary that Goma is the most dangerous airport in Africa, which should certainly make it one of the most dangerous in the world. The surrounding area with it’s high mountains and related weather must surely be part of that danger, but judging from the pile of planes alongside the runway, they may not be the only problem. Since I wrote this another aircraft has crashed in Bukavu, running off the end of the runway and killing many on board, including a top government minister. And yesterday a Boeing had tires blow out on landing. 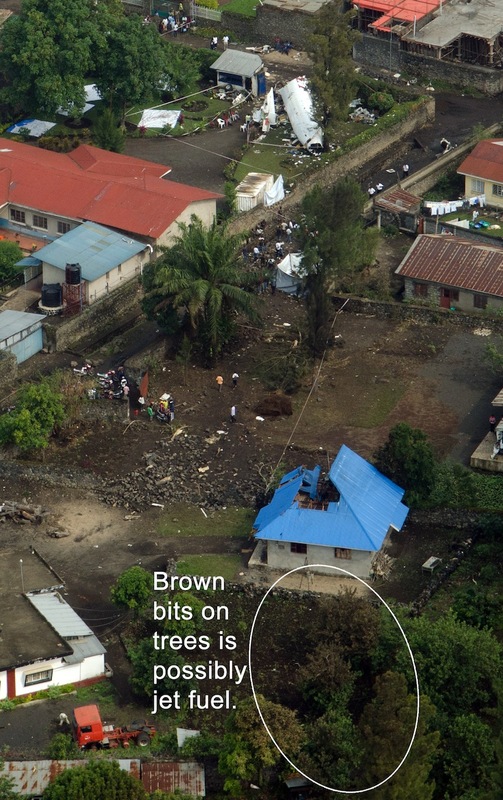 A few months ago they got all…well most, of the broken planes around the Goma airport and put them in two bigger piles. It is quite a sight. Boeing 727’s, 707’s, a Buffalo, a Dornier, and assorted Antonov’s. And that doesn’t even count the bits and pieces left over from really bad crashes. It makes one think. One of the piles of damaged airplanes alongside the Goma airport. This entry was posted in Aircraft, Pilot Technique, Pilot-Aircraft and tagged Aircraft Accidents in Congo, Fokker 50 crash, Goma, Plane Crash. Bookmark the permalink. Your blog was never neglected and I always enjoy reading your updates, so good luck with everything at work and keep blogging! I can’t find the article, but a couple of years ago I read that 14% of the world’s avaition takes place in Africa and something like 60% of the world’s accidents. I would not doubt that at all Ken. It is way to common here.